Published: March 26, 2013 at 04:01 p.m. 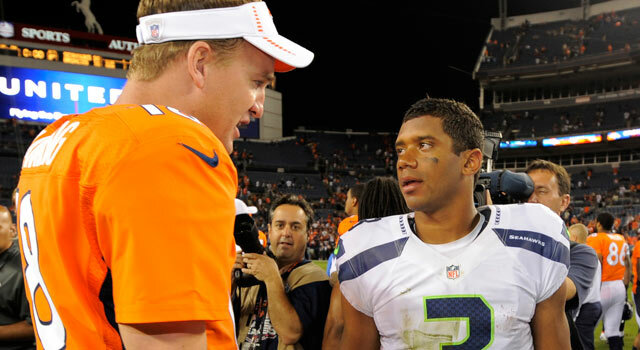 Updated: March 28, 2013 at 04:02 p.m.
Peyton Manning (left) and Russell Wilson head into next season leading two of the NFL's top rosters. The NFL might be a league of parity, but the rich have gotten richer since the end of the 2012 season. Don't look for any of last year's non-contenders on the list below. Those teams lost too much talent (Minnesota Vikings, Pittsburgh Steelers, St. Louis Rams, New York Jets), remain incomplete (Washington Redskins, Chicago Bears, Cincinnati Bengals, Indianapolis Colts, Dallas Cowboys, Tampa Bay Buccaneers, Carolina Panthers) or had too much ground to make up (Detroit Lions, Miami Dolphins, Cleveland Browns, Arizona Cardinals). Although they didn't make the list below, the New York Giants, New Orleans Saints, Philadelphia Eagles and Kansas City Chiefs are in prime position for bounce-back seasons. It's no coincidence that the teams with the strongest rosters leading up to next month's NFL draft ended up on Gregg Rosenthal's free agency winners lists (AFC, NFC) after deep playoff runs. All five of these teams made key pickups in free agency to solidify or improve rosters that already were stacked. The Seahawks of Pete Carroll and John Schneider go bold, taking chances on unconventional players that might not appeal to other teams. Adrian Peterson's reaction to the Percy Harvin trade speaks volumes about a dynamic player who could tip the balance of power in the NFC West. It's easy to forget that Harvin was a more valuable player for the Vikings than Peterson before the receiver's season-ending ankle injury in Week 9 of last season. Russell Wilson's offense averaged 32.4 points per over the final 10 games of the 2012 season (including the playoffs). It gets even better with Harvin, recently described by NFL Films analyst Greg Cosell as "a movable chess piece that advances the continuing evolution of NFL offense." The Seahawks also have added effective pass rushers Cliff Avril and Michael Bennett on the cheap to a defense that led the NFL in fewest points per game. Draft needs: This might be the one team with the luxury of selecting the best player available, regardless of need, throughout the entire draft. The Seahawks could use depth at linebacker and on the offensive line, but the most glaring weak spot is kicker, with Steven Hauschka unsigned. Peyton Manning's juggernaut Indianapolis Colts offenses ran on all cylinders when he had the luxury of an elite slot receiver, such as a young Brandon Stokley or Austin Collie. Manning now has the best slot receiver of his generation in Wes Welker to complement Demaryius Thomas and Eric Decker, the only duo to post 1,000-plus yards and double-digit touchdowns apiece in 2012. The rest of the Broncos' offseason moves also were solid. They picked up a Pro Bowl-caliber guard in Louis Vasquez to go with a physical cornerback in Dominique Rodgers-Cromartie and a run-stuffing defensive tackle in Terrance Knighton. In Von Miller, Denver boasts the most devastating linebacker in football (and second-best isn't even close). If John Elway can replace Elvis Dumervil with Dwight Freeney, this roster will rival Seattle's. Draft needs: The Denver Post is convinced the Broncos will draft a cornerback, running back and defensive lineman -- perhaps in that order -- in the first three rounds. Cornerback is more of a future need with Champ Bailey nearing the end of a Hall of Fame career. Likewise, a tailback with size likely will act as insurance for an aging Willis McGahee and brittle Knowshon Moreno. As Rosenthal pointed out, the 49ers actually have lost talent on balance this offseason. This roster still is in excellent shape, however. The offensive line remains the best in the league, and Anquan Boldin is a major upgrade on Randy Moss and an injured Mario Manningham at wide receiver. San Francisco's defense is anchored by the NFL's most daunting 3-4 linebacker corps since Jim Mora's New Orleans Saints defense thrived behind Pat Swilling, Sam Mills, Vaughn Johnson and Hall of Famer Rickey Jackson from 1987 to 1992. A secondary exploited by Matt Ryan in the NFC Championship Game and Joe Flacco in Super Bowl XLVII remains the 49ers' biggest concern, exacerbated by the defection of safety Dashon Goldson to the Bucs. Draft needs: Through a series of shrewd trades and compensatory selections for losing free agents, the 49ers have a whopping 14 draft picks this year. Safety and cornerback should be addressed early, with backup quarterback and defensive line depth next on the list. Don't confuse Steven Jackson with Michael Turner just because they're of similar age. Turner held the Falcons' otherwise up-tempo offense back while running with a fork sticking out of his back all last season. Jackson was the powerful, spry horse he always has been, carrying the Rams' subpar offense. With Jackson on board and Tony Gonzalez returning for a swan song, Atlanta is rolling out a veritable all-star team on offense. General manager Thomas Dimitroff did well to retain defensive coordinator Mike Nolan's chess piece in safety William Moore, but he also lost No. 1 pass rusher John Abraham as well as cornerbacks Dunta Robinson and Brent Grimes. If the Falcons lock up Osi Umenyiora, as expected, it will offset Abraham's loss. This defense still needs a stiffer backbone after being shredded by Russell Wilson and Colin Kaepernick in the playoffs. Draft needs: Dimitroff eventually has to find a successor to Gonzalez at tight end, but the major talent needs are on defense. Even with Umenyiora, the Falcons will need a complementary pass rusher while adding depth on the defensive line. Although Robert McClain quickly became a coaching-staff favorite last season, cornerback remains a major area of need. After leading the NFL at 34.8 points per game, Tom Brady's unit returns the same rock-solid offensive line as well as the league's most dangerous tight-end duo. The major change is at wide receiver, though don't rule out Danny Amendola as an upgrade over Welker in the slot. The Patriots have done some tinkering to a secondary that ranked 29th in the NFL against the pass in 2012, but most of the key figures remain in the place. The defensive backfield could continue to hamstring a relatively stout defensive front seven. Draft needs: The Patriots still are looking for a viable outside threat down the left sideline after cutting Brandon Lloyd. A speedy wide receiver should be near the top of their draft wish list. The rest of the needs are on defense, with pass rusher and cornerback help as the most glaring. The Packers have to fix the left side of the offensive line as well as a defense that rolled over for 579 yards in the divisional-round playoff loss to the 49ers. ... The Giants' roster was playoff-caliber a year ago, but injuries and an Eli Manning slump did them in. Another strong draft by general manager Jerry Reese will have them back in control of the NFC East. ... The Ravens have lost eight starters from last year's Super Bowl team. ... The Texans took a defensive hit with the losses of Glover Quin and Connor Barwin. The offense desperately is in need of a second fiddle to Andre Johnson in the passing game.